Contrary to lawless cyclist mythos, a study finds that nearly all cyclists in four Oregon cities stop for red lights. 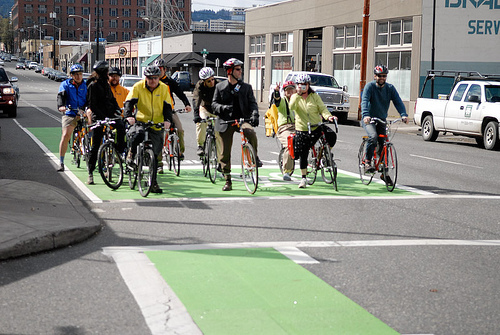 Nearly 94 percent of people riding bikes in Portland, Beaverton, Corvallis and Eugene stopped for red lights, a forthcoming Portland State University-based study of 2,026 intersection crossing videos has found. Of those, almost all (89 percent of the total) followed the rules perfectly, while another 4 percent entered the intersection just before the light changed to green. Only 6 percent of riders were observed heading directly through the red light. Based on the PSU study, there is no way to know if Oregon cyclists are more law-abiding than average. But some evidence has shown that cyclists are more apt to follow traffic rules when streets are safer for biking. According to Andersen, Monsere’s study found no difference in compliance on roads with bike infrastructure versus those without. Elsewhere on the Network today: Biking Toronto says the city finally has a decent protected bike lane, but there’s a catch. Delaware Bikes looks back at the drastically different city scenes that were possible before cars. And BikeWalkLee reports that Florida has adopted much stricter penalties for drivers who flee the scene after serious collisions.